with Swami Gurucharanananda, "Mataji" and Siva Buechner, RYT 500, B.A. Explore the power of Yoga practices to purify and transform your body and mind. Reconnect to your True Self and let it shine through your life as peace, joy, love, and light. Let your light shine out for all to enjoy! Midweek Seminars not only offer special lectures to help you deepen your practice, but also allow the time, space, and guidance to relax and go within. This is the perfect opportunity to embrace the quiet of the Ashram and the knowledge of its teachers. Join the daily schedule, take classes in your area of interest, enjoy the natural setting and sacred spaces, and connect with like-minded people. Swami Gurucharanananda, lovingly called Mataji, is a senior sannyasi (monk) and disciple of Gurudev, Sri Swami Satchidanandaji Maharaj. She serves on the Sannyas Board. Mataji is a guided meditation leader and Hatha Yoga teacher, an inspiring speaker, Integral Yoga® mentor, and private retreat guide, both in the US and abroad. She loves to offer pujas (worship service), read Sri Gurudev’s teachings at lunch, and play the violin as a wake-up call in the dorms! In 2014 she was awarded the Swami Satchidananda Lifetime Service Award. Mataji always has a loving, joy-filled smile ready for you! Siva Buechner, RYT 500, B.A. 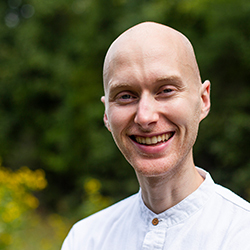 Siva currently serves in the Office of Spiritual Development at Satchidananda Ashram–Yogaville and leads sessions in Hatha Yoga, Yoga Nidra, and guided meditation. Prior to being at the Ashram, Siva studied at Wake Forest University, finishing with a double major in Economics and English. Shortly thereafter, he embraced the example of Mahatma Gandhi and embarked full-time on the spiritual quest: intentionally living without money, practicing daily meditation and Yoga, and being of service to the moment. By grace, he arrived at Yogaville in 2013 and has since received training in Raja Yoga, Meditation, Yoga of Recovery, and Laugha Yoga. Learn more about Siva Buechner, RYT 500, B.A.